In 2014 we might remember the 60th death anniversary of Prof Max Walleser. He was born in 1874 and passed away in 1954. Not much more is known about this German Indologist, Tibetologist and Sinologist. A list of publications placed online by the city of Heidelberg shows that he was able to publish during the First World War, but after 1927 no more publications are known, which means that his active period as a scholar lasted 25 years, from 1902 to 1927. In a footnote in his below-mentioned “Die Streitlosigkeit des Subhúti” (The Restfulness of Subhuti) he mentions his séjour in Sri Lanka. This voyage must have taken place before the year 1917. Others in his line of trade received a wikipedia entry, but in Walleser’s case it’s only the city of Heidelberg that honours its great son with an online list of publications. Publicist Huaijin Nan ( Basic Buddhism: Exploring Buddhism and Zen) and the Quang Duc community tell us that in 1928 Walleser founded an “Institut Fur Buddhismus Kunde”(Buddhist Studies Association) where he, says Quang Duc, teached a great many Indian and Japanese students. Those Northern European academics lectured and published in their own language; Walleser taught his foreign students German in the first place, and the other linguistic-philosophical matter simultaneously or somewhat later. In 1924 the British Pali Text Society publishes a commentary by Max Walleser’s hand on the Anguttara Nikaya, “The Buddhist Philosophy in its Historic Development“. Furthermore Walleser initiated a magazine on Buddhism studies, he filled the Heidelberg University library with relevant material and lectured inside and outside the University. Electric light was introduced in the year 1878, now the well-to-do citizens could light their homes at night and early morning wintertime. In 1925 London saw the first television. Prior to these days people stepped out of bed at daybreak and turned in shortly after the blue hour had past. They perhaps made a daily stroll through the park, one sometimes listened to a concert, sometimes visited the theatre, but generally people worked, worked, and worked. The fact that investigators, translators and others in those pre-1878 years were able to churn out such a vast amount of researched material can never be repeated, not even today when we’re able to make good use of information on the Internet. Like other Indologists Max Walleser started his career with the study of some of the Vedic scriptures. And although he delivered meaningful results in the study of the Buddhist Pali canon, he is generally remembered as a scholar of the Mahayana canon, more specifically of the Prajñya Paramitá-collection (PPS). Is the Pali canon somewhat “cleansed” of this mix of languages, the Mahayana manuscripts, dubbed “Sanskrit”, haven’t been so drastically altered as far as language and choice of words goes. They remain riddled with words that are altogether un-Sanskritic in the classical , Vedic meaning of the word. These manuscripts contain a new vocabulary that amalgamates Classical Sanskrit, Pali and “foreign” words. To disentangle manuscripts containing mish-mash like these was the task Max Walleser, his student Edward Conze and others set themselves to. At the age of 28, in 1902 Walleser obtains his PhD on “Das Problem des Ich” (The Question of the Self). In 1911 or 1913, the sources are not in unison, his translation of one of the PPS collections appears, the ”8000 lines” (= Asta-sahásrika): „Prajnaparamitá – Die Vollkommenheit der Erkenntnis“ (Prajnaparamitá – the Perfection of Knowledge [or Knowing]). After another scholar objects to Walleser’s translation of the word araNa, he in 1917 publishes his “Die Streitlosigkeit des Subhúti”, a pamplet of 51 pages.The following sections of this blog will deal with this “Streitlosigkeit” (restfulness), i.e. araNa — according to Walleser. It’s “Die Sekten des alten Buddhismus” (The sects of Ancient Buddhism) that in 1927 seems to mark the end of Max Walleser’s productive years. Technical terminology of Buddhism ís important since it describes certain role models and their line of practice. It is therefore not a waste of time to give some attention to the little known word of araNa and its connection, or non-connection, with the character of the Arhat Subhúti. [ Picture 1 shows the retroflexed n with the “under-dot”, (múrdhanya ) in the Devanágari script used to render Sanskrit litterature. In somewhat Latinised form this dot appears under the n. Since this blog version does not allow for such diacritics the retroflexed n in arana is rendered as a capital n: araNa. “Die Streitlosigkeit des Subhúti” answers prof Otto Franke critique. In 1915 he objects against Walleser’s choice to translate araNa with “restfulness” (Streitlosigkeit). And by the way, I chose “restfulness” after considering Walleser’s interpretation. This interpretation of Max Walleser’s interpretation is mine. I might be wrong. Generally the Chinese Buddhist community holds he opinion that the name of Subhúti solely occurs in Mahayanistic manuscripts, not in those of the Southern tradition. The following sections will show that this is incorrect. In this Rgveda, a seminal work in Hinduïsm, particularly in RV III.7, we read the expression raNya-vácah that has been translated with “loving speech”. In section III. 5. 55 (see http://www.sacred-texts.com/hin/rvsan/rv05051.htm) we find the tree times repeated “á yáhy aghne atrivat sute raNa”. Though unaquainted with Vedism my rendering of this utterance goes into the direction of an “exalted” (raNa) “utterance” (sute) with regard to the deity or deified “fire” (agne / agni). Hence the above-mentioned raNya-vácah possibly is not “loving speech”, but “exalted speech”. These two examples, raNya-vácah and “á yáhy aghne atrivat sute raNa”, do not occur in Walleser’s paper. RV VIII.2.42 mentions a “ráNasya naptyá” which Walleser translates as “Töchter der Freude” ( daughters of joy). We might decide that “daughters who speak or sing in exaltation” would be a better choice. And in this same paper we see raNa used with regard to “a drunken god Indra”. As far as I know drunkards, and I knew a few in younger years, they tend to “sing”, generally in an exalted way. Therefore it might be that Indra, after visiting the local Inn, burst out in exalted praises of whatever he wished to praise. (There’s both humour and seriousness in this section). AraNa could therefore be considered a rejection of raNa: “exalted is refuted and answered with “unexalted”. This “unexalted” (araNa) however does not yet occur in any English language Buddhist translation. In ony a few places in the Buddhist canon we come across araNa; it never attracted much attention, with the exception of the professors Walleser, Conze, Franke, Horner, and two or three contemporaries of Walleser, Franke and Conze. It’s however the relatively recent interest in the art of the exalted bhadjan singing that allows us to interpret utterances such as “á yáhy aghne atrivat sute raNa” as a form of bhadjan, an exaltation of the godhead, whatever he or she or it represents, and we might interpret it as the strong emotion experienced by both the singer and the devoted listener of bhadjan. AraNa, Franke said, ought not to be translated with “restfulness” (Streitlosigkeit) but with “passionless” (Lustlosigkeit). Franke rested his opinion on the writings of the below-mentioned Simhabhadra when the latter discussed the Astasahasrika Prajñya Paramitá. Franke points to Simhabhadra’s writings, an 8th-9th Indian monk-translator who was of the opinion that the word raNa (see yesterdays blog) ought to be judged as a klesa, a mental taint. Simhabhadra’s definition constituted not an etymological rendering of the word but rather a qualification of the Vedic and Brahmanical raNa. I wasn’t there when he lectured, but for all I can understand he fulminated against raNa and what it stood for: “this raNa, I tell you, it’s a klesa!” in his commentary on the Astashasrika PPS he indeed renders raNa as “klesa“, and as such it enterend the Tibetan Buddhist thinking, and that of Otto Franke. Simhabhadra’s countrymen must have right away understood his point of view as a rant, not as a literal translation, but his Tibetan students did not and returned to their country, not with an etymological rendering of the word raNa, but with Simhabhadra’s qualification and implicit rejection of the exalted practice of bhadjan singing, see the below words in the final conclusion. Franke’s choice for araNa as “passionless” has to be understood in the light of Simhabhadra’s judgement. Franke came close, but not yet close enough. Later generations, for example I B Horner, chose to translate araNa with “undefiled”, equally close, but not close enough. Simhabhadra, aka. Haribhadra, was a student of Sánta-rákshita (725–788), says Lobsang Norbu Tsonawa. Simhabhada/Haribhadra specialized in Perfection of Wisdom studies and the tantric sadhána of Maitreya Buddha. He wrote a famous commentary to Maitreya’s Perfection of Wisdom teachings. (One still struggles with the question whether “Maitreya” refers to the famous bodhisattva or to a monk bearing his name.) Simhabhadra/Haribhadra could have been one of the monk-scholars at the ancient Nalanda University in Bihar, India. There is hardly any information on this scholar, but it’s safe to say that he became a root guru of Tibetan student-monks. With his rejection of araNa as “passionless” I think Otto Franke implicitly shares Buddha’s opinion when he denies his contemporary monks the right to listen to music. We have to understand this against the time in which they lived and in the sense of the above-mentioned bhadjan-sessions in praise of the Vedic gods and godly natural phenomena. Buddha never ventured to speak out against the use of names of gods like Indra and Brahma – with the exception of Brahma when it came to the opinion that Brahma was/is immortal –, but he was outspokenly against the deïfication of natural phenomena. It constituted a major part of his rejection of Brahmanism and the Veda. He did not wish his monks to be carried away in an exaltation (raNa) of the Vedic gods, let alone in exaltation towards phenomena like fire, water, earth and air that in his philosophy were nothing more but natural phenomena, not godheads. He furthermore considered being carried away by extreme emotions a blocking out of the clarity of mind which is so characteristic for his way of observing the inner and outer world. We find the word araNa in the Pali collection of the Southern Buddhism, in a text called the AraNa-vibhánga-sutta ([PTS] M III. 230-238 (235). I.B Horner translated part of this Middle Length collection for the Pali Text Society. Vol III was first published in 1959, hence after Max Walleser’s years as lecturer. That is to say, it may have been present somewhere in its Pali script, but not yet in I B’s translation. She translates the given title AraNa-vibhánga with “The analysis (vibhánga) of the undefiled (araNa)”. Reading the text we must conclude that this is a late Mahá-viháraya, i.e. a Srilankan reworking and amplifying of Buddha’s first official teaching, the Setting in Motion of the Wheel of the Dharma (or Dhamma). What is araNa according to this text? It comes down to: “not being intent on the happiness of sense-pleasures …, not being intent on self-mortification. …. (After leaving approval and disapproval aside) one should be intent on inward happiness …. “. Follows a section on right speech — not slander, vex etc., “not speaking too fast”, or “in a dialect of the countryside”… … “This is the exposition of the undefiled (araNa)”. Here we see that araNa is not given in the sense of “no inward conflict”, or “restful” (Streitlosigkeit) but in the analysis of araNa as absence of klesa, menta taints (see he above section 3). Before proceeding to the Mahayanist interpretation of the name Subhuti and the word araNa, it is necessary to dwell on the context in which araNa (retroflexed n, picture 1) has been used, respectively on the question whether misspelling or misinterpretation could have occurred. Both in the Pali-collection and in that of the Sanskritic Mahayana-manuscripts we find technical terms like áraNa-vihárin, áraNa-samádhi, and (solely in Pali) áraNa-sáraNa . Max Walleser mentions these terms in his “Die Streitlosigkeit …” and writes that a few translators came to the conclusion that araNa-vihárin, he who dwells in (vihárin) araNá (whatever meaning this word is given) should be read as aráñña-vihárin: he who dwells in (vihárin) an arañña, a forest. A translator using the original devanágiri script could not make such a mistake since the n of araNa is quite different from the ñ in aráñña (compare the above pictures 1 and 2). However, would such a scribe have listened to his teacher, and would he have taken notes as any student did in the pre-IT era, the case might have been altogether different. In that case the scribe might have heard something that was not said or meant. That is to say, the teacher could have uttered an “áraNa”, and the scribe could have heard an “aráñña”. Likewise, some were tempted to rewrite araNa-samádhi as aráñña-samádhi: he who dwells in samádhi (mental cultivation in the broadest sense of the word) in a secluded place, a forest (aráñña). And there were some Theravádin who contrasted araNa and sárana, and concluded, on the basis of entries in the Pali Abhidhammic collection, that araNa, the undefiled according to I B Horner, means that dwelling in araNa simultaneously includes having taken shelter (sárana) from the klesa, the mental taints. This particular interpretation is a highly moral one – as the Abhidhamma is highly moral — as we have seen with respect to the title of the AraNa-vibhánga: the analysis of the (morally and mentally) undefiled. Prof Walleser includes the translations made by Tibetans and Chinese. The Tibetan translation of the relevant section in the Kanjur follows Simhabhadra’s opinion that raNa should be considered klesa (plural), mental taints. The Chinese interpretors, that is, those texts that Walleser had access to, chose to render the word raNa literally. Anyone who reads the ideogram could pronounce it as raNa, but also as chêng: “debating” (mit Worten Streiten, debattieren, Waleser p.10) If these Chinese translators would have come across the word araNa, –which probably does not occur in the Chinese Buddhist ágama,the Small Vehicle section that is the counterpart of the Pali Nikáya and the Tibetan Kanjur — they would have interpreted it in the same sense as Walleser does: “Streitlosigkeit”, i.e. restfulness or “not quibling”. Tomorrow we will see that this is precisely the choice made by Kumarjiva, the 4th-5th cent. scholar-monk who translated by decree of the then Chinese king. As far as Walleser’s research goes – and we must remember that he himself had to build an entirely new Heidelberg library on Buddhism and Vedism – he had to make do with an incomplete collection of texts, hence with incomplete entries on the name Subhuti. He leaned on Rajendralala Mitra’s in 1882 printed section of the Nepalese Ávadána, legendary tales comparable with the Játaka. In these Ávadána the name of Subhuti appears some 5 times, though never in connection with a particular line of meditative practice except once. One entry in this Avadana mentions Subhuti in connection with the Prajñya Paramitá litterature (PPS). The PPS-collection is about realising thorough, dual emptiness, the emptiness (sunyatá) of beings, and that of things. Probably thanks to his trip to Sri Lanka where a few Universities hold huge collections of Buddhist canonical texts, commentaries, sub-commentaries, and sub-sub-commentaries, Walleser encounters the name Subhuti in the Hinayana collections: once in the Theragatha (Songs of the Elders), once in the Udána, once in Buddhaghosa’s writings, and (upon return?, thanks to his Japanese students?) 2 times in the Ekottara Ágama, being the (Chinese, that is, kanji) Mahayanistic counterpart of the Pali Nikaya. As said before, in the few instances where the Small Vehicle manuscripts contain the name of Subhuti, no specific practices are connected to him. This would have to wait until the Prajñya Paramitá litterature came to the fore. The Nanjio Encyclopedia, named after the Japanese scholar who attemped an overview of all the Mahayanistic titles that had survived the ages, in Nanjio nr. 1640; TE.XXXVI.11, the name Subhuti is mentioned in a late list, the Fan-i-ming-i-chi, where ten practitioners-Arhats are mentioned, and in this list Subhuti is considered foremost in the realisation of emptiness (sunyatá). As far as the names and descriptions goes, this Chinese list is identical to a list in the Pali Anguttara Nikáya (AN), with the exception of Subhuti. Subhuti not being mentioned in the AN must have been the reason for the above-mentioned opinion that Subhuti is not a character in the Pali Scriptures. He is, though not in this AN manuscript. No doubt the Fan-i-ming-i-chi entry is based on an interpretation of the PPS litterature. Specifically in the Diamond Sutra, a section of the PPS, Subhuti is Buddha’s interlocuteur. Initially he doesn’t know anything yet about emptiness (sunyatá), hence he asks the question. But at the end of the exposition he is well informed and enlightened. As far as other texsts in the Mahayana collections goes, it stands to reason that with his own translation of the Asta-sahásrika Prajñya Pramitá at hand Walleser heavily drew upon this manuscript. However, a first translation of the Lotus Sutra by the hand of Eugène Burnouf (1852) may not have been available in Heidelberg, nor Hendrik Kern’s translation that appeared in 1884. The Suràngama Sutra, that is, the translation by Upasaka Lu Kuan Yu is a 20th cent. version, whereas Kumárajiva’s (350 – 413?) translation of the Suràngama-samádhi-sutra (S-ss), in 1965 rendered in French by Étienne Lamotte received an English language version in 1998. This manuscript deals in a way with the character of Subhuti where he is said to have been the “foremost in merit among the srávakas (Small Vehicle Arhats) but not among the bodhisattvas“. And in unison with the Chinese interpretation of araNa as “not debating” Kumárajiva, who grew up among the Chinese colonists along the Silk Road and translated in China’s capital city of those days, encountered Subhuti in the sentence araNavihárinám agryah which Lamotte translated (p.228) with “(Subhuti being) foremost in the absence of discord”, this being identical with the Chinese redering or the word (see yesterdays entry). It is worth mentioning that Kumarajiva did not conflate the concepts of sunyatá and araNa, see below. His were not yet the days of chan (zen) masters however much later generation of zennists held the opinion that theirs was a line of practice that directly came down to them from Buddha (Sakyamuni) himself. Considering that the PPS-litterature could be called the first full-fledged Mahayana-text, as yet without the mention of the word “bodhisattva”, we might decide to place the Lotus Sutra somewhat later, that is to say, closer to our times. What has the Lotus Sutra to say about Subhuti? Chapter 6, sections 16, 17, and 23 deal with the character, but nothing much is said: in a faraway future Subhuti will be a Buddha with miraculous powers. On the basis of what practice he aquired these powers remains unclear unless we accept the statement that in former lives he served innumerable Buddhas, and that this dedicated effort alone is already sufficient practice that inevitably leads to Buddhahood. More or less the same goes for the Suràngama Sutra (Lu Kuan Yu’s translation). Initially the Arhats Subhuti and Maha-Kásyapa are scolded because they didn’t manage to realise Universal Mind. Somewhere mid-section this manuscript there is mention how Subhuti and others followed a “brahmacharin”, a Dharma-farer, who taught them Buddha’s Teaching, and how they “achieved the state beyond transmigration”. At the end of the section on Subhuti he “rose from his seat, prostrated himself …” and declared that now he could remember his previous lives. Hence it is not in the Lotus Sutra, nor in (Lu Kuan Yu’s) Suràngama Sutra that the name of Subhuti and the concept of araNa are interlinked. But in Kumarajiva’s opinion (S-ss), mentioned above, they were. The implicit suggestion is that Subhuti, according to the Mahayanist zennists, is the “one who dwells in emptiness” (sunyatá-viharin) and at the same token “one who dwells in araNa” (araNa-viharin). The evolution of the character of Subhuti could be described as a linear one, but not so for the word araNa. The meaning of araNa meandered up and down the ages and evolved according to the needs of the speaker and the tradition he represented. The Hybrid Sanskrit and Pali AraNa cannot be divorced from its Sanskrit Vedic root raNa: exalted. The original meaning of araNa, a word that did not come to the fore until the days of the above mentioned Kumarajiva, should therefore be rendered as “unexalted”, but has from the onset been used in an altogether different context. Had it kept its original meaning as a refutation of the exalted practice of bhadjan singing, that is, the practise of those who sing the praises of the Vedic scriptures and (pre)Hinduïstic gods and what they represent, and would Simhabhadra not have offered his judgement and rejection of raNa in lieu of a more objective etymological rendering, raNa would never have been associated with the klesa (mental taints), let alone with the emptiness (sunyatá) of the Mahayana zen masters. AraNa is nothing more, or nothing less, than a state of mind in which mood swings are absent. Buddhist organisations both in the north and in the south of Korea planned to hold the annual day of remembrance for Han Yong-un (1879-1944), dubbed a Buddhist reformer and nationalist. On June 20, 2014 the South-Korean government had yet to approve the meeting planned at the Buddhist monastery on Mt Kumgang, a South-Korean enclave on North-Korean soil. Han Yongun is in western countries remembered as a Buddhist monk ánd a composer of love poetry. When we search online the first thing we encounter are his love poems. His “Love’s Silence” was completed in 1925. It is said to be an anthology of not only poems about love in the romantic sense of the word, but also about the universal love that Buddhism presents under names such as maitri and metta in Sanskrit and Pali, and pagae in Korean. In 1955 the Korean Jogye Order restructured itself as a staunchly celibate school of Buddhism. But earlier, under Japan’s colonial rule all Buddhist schools were under the obligation to follow Japan’s example both in religious outlook and practice as in married priesthood — if the priest so wished. There are no sources in western languages that indicate Yongun’s affiliation to a specific Buddhist school. The only thing we know of him today is that especially the Jogye Order honours Han Yongun as a reformer of Korean Buddhism. According to Jung-Shim Lee (Korean Histories 3.1 2012) “recently scholars have begun to express deep concerns about the hero-worship of Han Yongun …” Yongun, in his capacity of editor of a Buddhist newspaper published an article in 1930 that according to some could be interpreted as at best not opposed to Japanese colonial rule. imperialism of the Japanese, but as a means by which the Korean population could define itself as physically, mentally and morally totally reliant on itself and independent and quite apart from claims and exigences by others. And he tried, wrote Pori Park, to establish a “Buddhist reformation (as a) national identity” with this self-reliance as the centre-pole inside the stupa. We cannot say that Han Yongun’s view belied the core of Buddhism. We might however say that it lead to an exaggerated and principally unwholesome Korean Buddhist veneration of the monk-warrior. 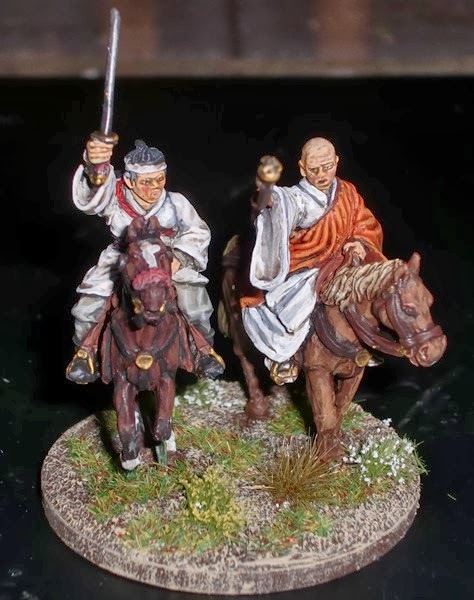 To this day webshops offer clay figurines such as the “Choson era (1392-1897) monk and guerilla commander”. This veneration of the readiness to actually fight arms in hand rests on a misinterpretation of the events during the night in which Buddha attained enlightenment by succesfully fighting “Mara’s army”. Han Yongun and others misrepresented this canonical texts, or commentaries on canonical texts, in which Mara is presented as an actual fighter, a demon leading not one but ten armies of fighter-demons. In reality of course, Mara is none other than our longing for a permanent and perpetually refreshed enjoyment of the senses, peace of mind and ease in life. Mara’s “armies” consist of the most prominent factors that keep us busy: sensual pleasures, discontent, hunger and thirst, craving, sloth and torpor, fear, doubt, conceit and ingratitude, gain, renown, honor and whatever fame is falsely received, and “whoever both extols himself and disparages others”. This last and tenth of Mara’s armies, by the way, that of being invited not to disparage others, is to this day the most misunderstood and most misused tool in the hands of those who tend to deviate from the path: you’re not allowed to criticise me because then you belong to Mara’s army — you’re doomed. Jung Shim-Lee points to Han’s earlier (1913) “A treatise on the reformation of Korean Buddhism” (Choson Pulgyo yusillon). “Self-reliance, self-blame, and self-esteem”, writes Lee, are argued by Yongun to be the guiding principles to reform Korean Buddhism. His main concern is that of reformation of Korean Buddhism in a blameless, faultless and therefore invincible corpus: “Whoever makes you poor is not the rich but you yourself. This is the heroic spirit that Han Yongun tried to instill in his compatriots who went through very difficult times. But we must admit that here he severely deviates from the spirit of any of the canonical texts in which Buddha points out that it is not only we ourselves that can make us poor, weak, distressed, but that we’re allowed to look around and spot others who spoil the party. In order to see light, the Huayen school of Buddhism would say, there necessarily is darkness. The Chinese Huayen School is called Hwa’om in South Korea and is the Korean Buddhist school of thought represented by the Jogye Order. Had Buddha not pointed out these simple fact of life, he would never have invited his entourage to show compassion, helpfulness, and co-operation in order to establish other beings into a life and mindset in which they feel free to strive for the happiness of nirvana. The Jogye Order that sports Buddha’s saying “Hatred does not cease by hatred, but only by love; this is the eternal rule” on its website, will in its north-south meeting certainly not have given too much attention to those writings of Han Yongun that could instill different deviations from the Middle Way. This annual remembrance day is one of the few occasions where Buddhists from north and south can meet, in a spirit of mutual Koreanness, nurtured and promoted by the said Han Yongun. Between June 9 and 12, 2014 a delegation of the Jogye Order took part in the 35th Japan-Korean Buddhist Cultural Exchange Conference in Gyushu Kurumishi Jhendouji. It’s one of the initiatives that surely but not hastely tries to heal the wounds between both nations. As if to belie the opinion that Korean Buddhism, at least in the Jogye Order, is overly tough, European newspapers on July 18, 2014 showed a video with rapping nuns, (sunim) cheared on by an enthousiastic crowd.